Help us on our journey to Reduce the Risk! In January 2018 The George Pantziarka TP53 Trust will begin a long and important journey, to which it is completely committed – to identify cancer risk-reduction strategies for patients with LFS. Given that there are currently no widely accepted risk-reduction strategies, apart from double mastectomy for women and regular screening for both sexes, this task will become a central part of the trust’s focus. To begin this journey, we will be embarking on our first ever research project which will take place over a eight-month period. Amazingly, it will be carried out at one of the laboratories where p53 was first discovered – at the University of Dundee. What will our project involve? 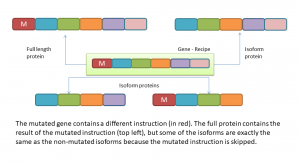 LFS patients’ cells will be taken and tested in the laboratory, to find which of the group of different proteins (isoforms), produced by the TP53 gene, are present in these LFS patients, and which are mutated. Some of these will be compared to a family member without LFS. A number of common drugs will be applied to the LFS cells, to see if they decrease the risk of cancer developing (there is now growing clinical evidence that drugs such as aspirin, metformin and statins have anti-cancer effects). If certain drugs are shown in the test tube to reduce the risk of cancer developing, we will plan the next stage of research – in mice or humans. Yes, this is a long, slow process – which makes the need to get going even more urgent. Total cost of the project is £54k. The University of Dundee is contributing £34k. The trust needs to find £20k. Thanks to the efforts of many of you, we already have £5k of that money – thank you! We are applying to trusts and foundations for £10k. Between now and the end of the project (August 2018) we need to raise the remaining £5,127 – with your help. Together we can do it! Could you hold a sale at work, or in your local community centre/church hall? Would your child’s school hold an event to raise money for us? Will your office allow a dress down day, in return for a small donation? Could you organise a football or table tennis tournament for an entry fee and a prize donated by a local business? Could you organise a pub quiz? Or would you prefer to simply ask your workmates/friends/family to make a small donation online? 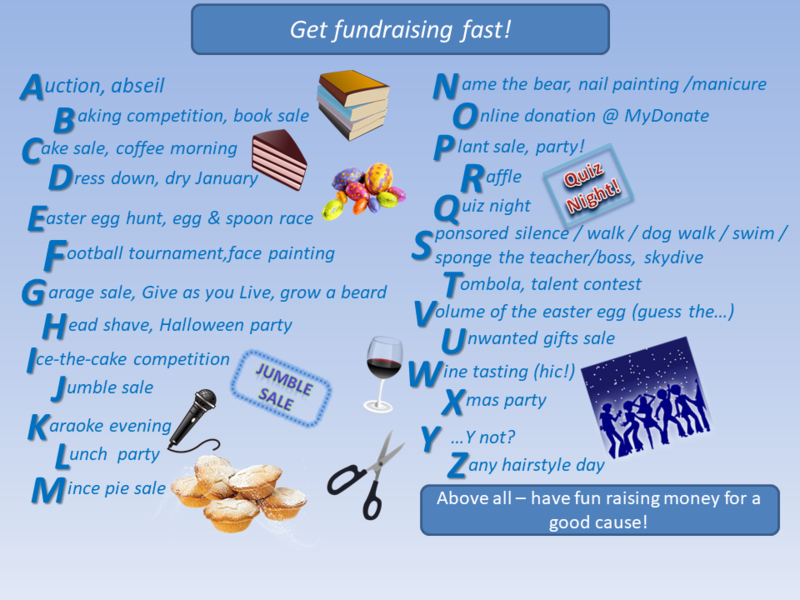 If you’re out of ideas, have a look at our A-Z of fundraising ideas below – and remember, every little helps us to get closer to our target! Pay online: via www.mydonate.bt.com and type George Pantziarka into the ‘Donate to Charity’ search box to find our page. For sponsored events, you can set up your own MyDonate page (simply follow the fundraising instructions). If you prefer, you can use this sponsorship form and send a cheque plus the form to us, with Gift Aid box ticked if appropriate. If you are a UK taxpayer, make sure you tick the Gift Aid box! For every pound you donate we receive an additional 25p from the Inland Revenue meaning your money goes even further. Simply visit the link www.giveasyoulive.com/join/gptp53 and raise free funds for us every time you shop at any one of over 4,000 stores online. It really does cost you nothing. Oh, and remember to use it every time you shop! Remember that big/public events can require special licences, insurance etc. So you may wish to keep it small and fundraise amongst a community of invited guests, such as at work/school. Here’s a quick summary. You need a licence to hold a collection in the street and other public places. Raffles held as part of an event in one venue, within a 24-hour period, can happen with cloakroom tickets, but those going beyond 24 hours require a local lottery licence and printed tickets, with certain legal requirements for what is printed on them. You will need a licence to sell alcohol at an event. You need a licence if you plan to have a band or vocalist at your event. Any publicity must include the following; The George Pantziarka TP53 Trust registered charity number 1157167, registered in England and Wales. An event that involves the general public requires public liability insurance. In a school or workplace you may be covered by their insurance. Food served at a public event is subject to several rules governing preparation, contamination etc. Please check these out thoroughly. Thank you, thank you, thank you! Every amount, no matter how small, will help this project to happen successfully. This is our project. Let’s make it a success!